Whalley Abbey is the late 13th century stone Cistercian abbey of St Mary the Virgin, founded by Henry de Lacy. In 1348, Abbas et Conventus de Whalleye, was granted a licence to crenellate the church and the close of the abbey, by King Edward III. The north precinct wall of the great court, is still flanked by round bastions and a fine 15th century stone two storey north-eastern inner gatehouse. To the north-west and standing to the height of its eaves, is a long 14th century stone two storey outer gatehouse, with a first floor chapel. 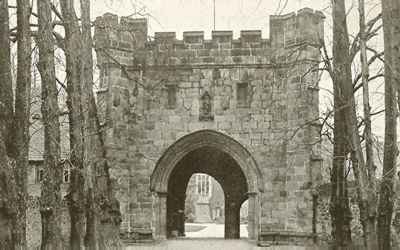 In 1537 following his involvement in the 'Pilgrimage of Grace', Abbot John Paslew, was executed for treason in Whalley and the abbey dissolved. 4 miles north is Clitheroe Castle. Whalley Abbey is located in the village centre, off The Sands. 6 miles north-east of Blackburn, on the A666. The site belongs to the Diocese of Blackburn and the grounds are open daily, 10:00-4:30pm. The outer gatehouse, is freely accessible in daylight hours.